Dr. Richard Rosenfield completed his residency training at Stanford University Hospital, then moved to Portland, Oregon where he has been practicing medicine since 2000. Dr. Rosenfield’s minimally invasive methods to surgical procedures have garnered him a large clientele base and made him well known for his surgical talents. His new innovative surgical techniques and approaches in the field of gynecology have led him to conduct lectures nationally and abroad. He pioneered new methods for outpatient approach to fertility and sterility, robot surgery in gynecology, hysterectomy, and the Essure® method of permanent contraception. 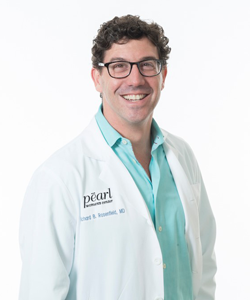 Dr. Rosenfield remains an active member as a business owner and educator in the Portland metropolitan community, frequently lecturing about gynecological focuses. His part in the Medical Advisory Committee of Komen of Oregon shows his great passion for women’s healthcare. Due to his commitment to improving the value of patient care globally, Dr. Rosenfield created a helpful online video based surgical community. He started SURGiVIEW.com online, where surgeons can discuss their surgical methods, experiences, and top techniques. In his down time, Dr. Rosenfield loves spending time with his two children, playing the guitar, and enjoys hiking, SCUBA diving, skiing, and traveling.